I recently authored an article that examined the spectral characteristics of natural sunlight and how water depth of only two inches altered light quality. 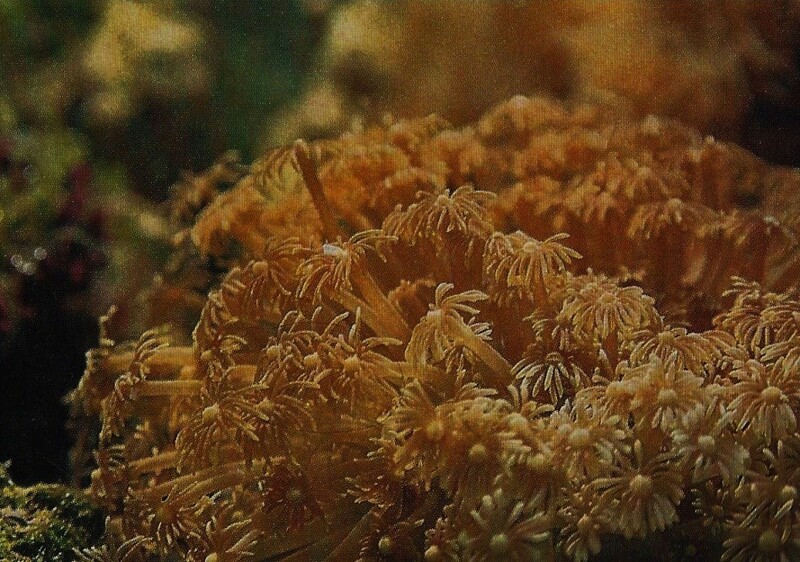 Selection of the shallow depth was deliberate – the scope of the associated experiments was to examine the maximum amount of each color (spectral bandwidth) that fell upon corals (for instance, were corals receiving more red light in an aquarium than in nature?). After publication of these results (see http://www.advancedaquarist.com/2013/11/aafeature), readers asked obvious questions (why was the depth so shallow?) 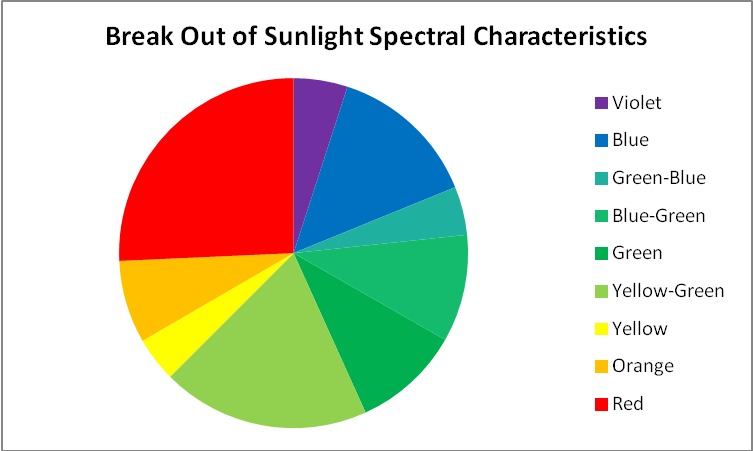 and requested more information, particularly about spectral qualities at more depth. Logistical challenges would prevent repetition of the initial data gathering procedure – launching floating computer and battery-driven spectrometers and data loggers in deeper portions of the Pacific Ocean while hoping for clear weather throughout the day and preventing loss due to accident or theft is no easy task! After realizing I probably could not overcome the many obstacles preventing the gathering of data at greater depths, I began researching existing literature in order to estimate spectral qualities of light as it penetrated clear oceanic water. This article will present this information, along with the caveats we must realize when interpreting these data. A shallow reef at Kahalu’u Beach Park, Big Island of Hawaii. First, the spectral characteristics of sunlight reaching the earth’s (or ocean’s) surface are similar, but not absolutely uniform. Once light enters a body of water, absorption characteristics of the water column must be considered. 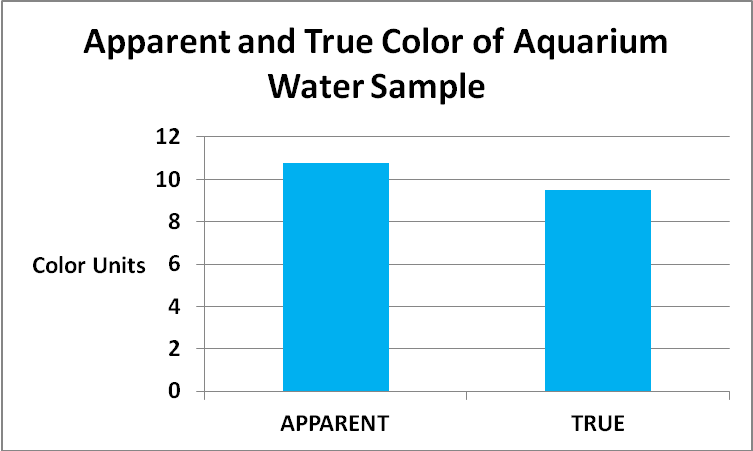 In addition, we have to estimate the qualities of aquarium water in order to make meaningful comparisons. Light dosage (Daily Light Integral, or DLI) has to be considered as well. (DLI is calculated by multiplying the instantaneous PAR values (the number of photons falling upon 1 square meter per second, reported as µmol·m²·sec) by the number of seconds in the photoperiod and dividing by 1,000,000 to arrive at mol·m²·photoperiod.) Finally, optical qualities of aquarium water should be considered before meaningful comparisons are made. We will now examine these factors in more detail. 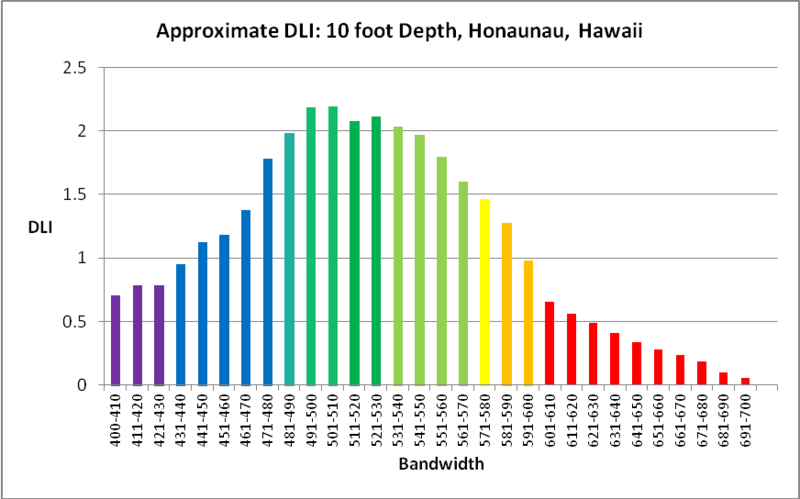 An astute hobbyist will quickly recognize that bandwidths used in this article are different from most other references. For instance, bandwidths for those colors at opposite ends of the visible (violet and red) spectrum are truncated. The reason is this – calculations of the total dosage of light require knowledge of spectral characteristics as well as light intensity. Many researchers (Jerlov, 1976) and advanced hobbyists (such as Joshi, 2013) have used microwatts to report light intensity. This is perfectly acceptable if we are concerned only with energy produced by a particular light source. However, ‘microwatts’ is a radiometric standard that reports the energy of light according to wavelength – blue light is more energetic than red light. Where photosynthesis is concerned, the energy of a particular wavelength does not matter – the ‘color’ or energy level of a photon is irrelevant where photosynthesis is concerned. If a blue photon is absorbed by a photopigment (chlorophyll, peridinin, etc. ), it will promote photosynthesis only as well a ‘red’ photon. Therefore, radiometric information, when plugged into our formulae for use in photosynthesis experiments, is not suitable. We should use another standard, and that is Photosynthetically Active Radiation (PAR). See Kirk (2000) for details. This presents another problem – PAR, or quantum meters, report wavelengths ranging from 400 to ~700nm. Hence I have elected to use quanta measurements to report energy in the range of 400nm to 700nm. Table 1. Sunlight’s spectral composition in per cent per bandwidth. We generally think of pure water as a clear liquid when it is, in fact, a blue liquid – it absorbs blue wavelengths weakly but begins to absorb light more strongly at wavelengths above ~550nm. It significantly absorbs red light (about 35% of red light (680nm) is absorbed by a 1-meter deep column of pure water.) 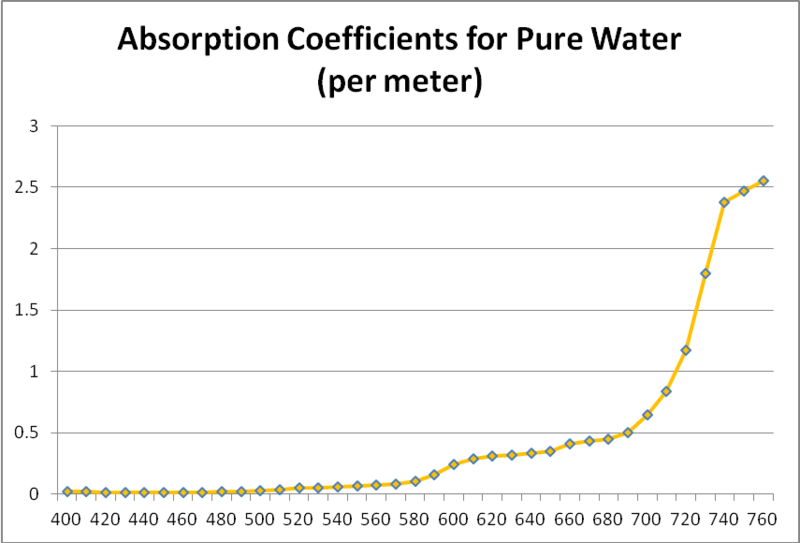 See Figure 4 for absorption coefficients. Figure 4. 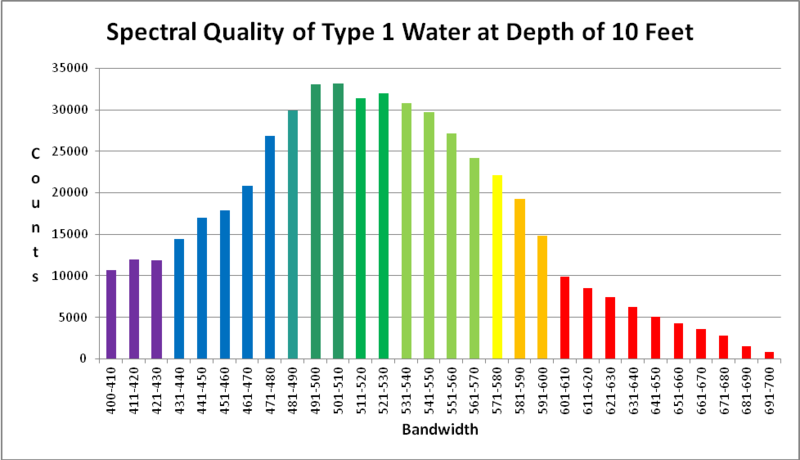 Attenuation coefficients of pure water – violet, blue and green is only weakly absorbed, while red is rapidly attenuated. 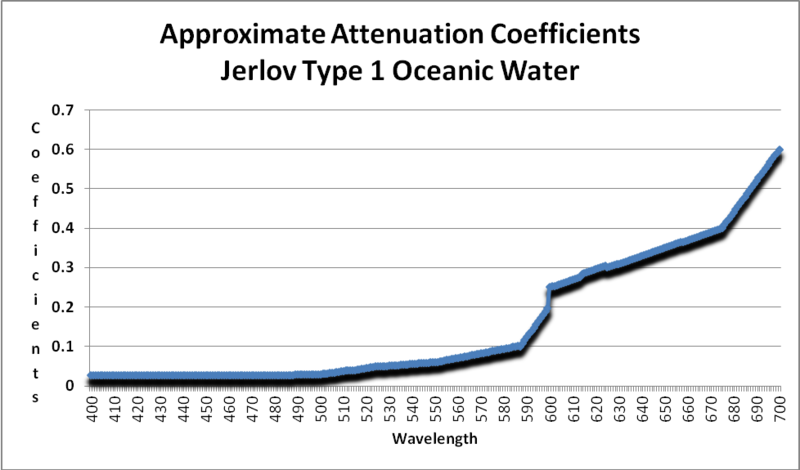 Jerlov (1976) classified seawater into two categories – Oceanic and Coastal. These categories are based on factors that cause attenuation (weakening) of light by absorption or scattering caused by dissolved substances or suspended solids. Oceanic water is further divided into 5 subgroups (Types I, IA, IB, II and III). 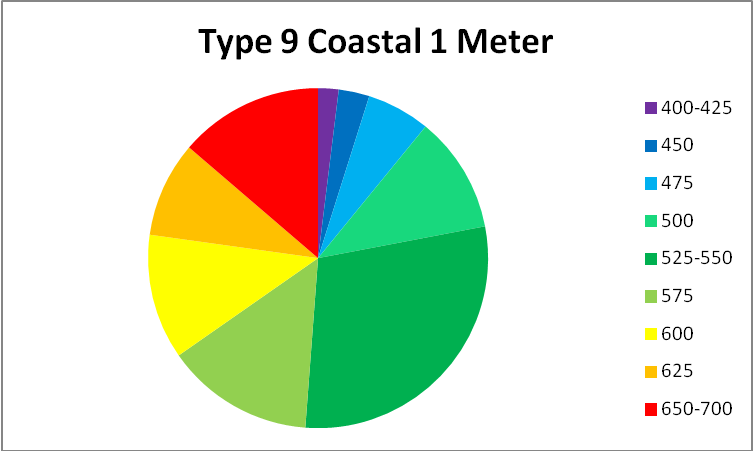 Coastal water also has five subgroups (Types 1, 3, 5, 7, and 9). In both cases, the higher the number associated with a type of water, the less transparent it is. Oceanic types are the ‘clearest’ and contain few suspended solids, or dissolved substances that lend a yellow or red appearance. On the other hand, Coastal waters are often, if not constantly, under the influence of runoff (rivers, rainfall) from land masses and may have high turbidity and/or color. To make a very general statement, Oceanic waters might be considered clear and blue, while Coastal waters are cloudy and might be yellow due to dissolved organic matter or greenish due to high populations of phytoplankton. 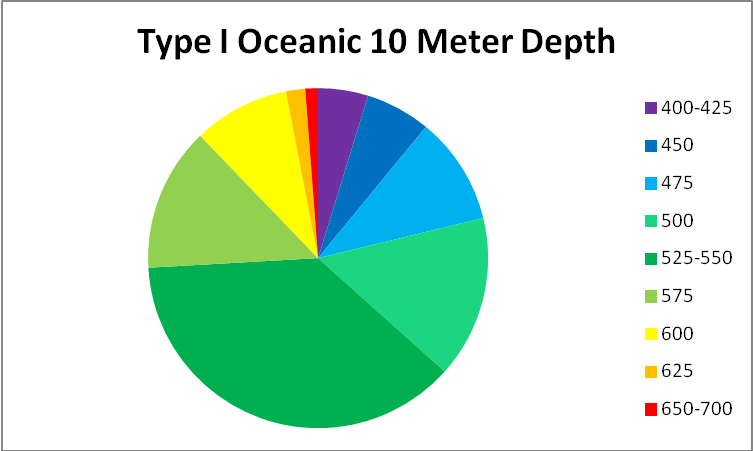 See Figures 5 – 9 for approximate percentages of light (by color in 25nm increments as reported by Jerlov) at 1 and 10 meter depths for the clearest seawater and the dirtiest, respectively. Figure 5. Jerlov reports spectral qualities in 25nm increments. Later in this article, we’ll refine this information in this article and use 10nm increments. Figure 8. 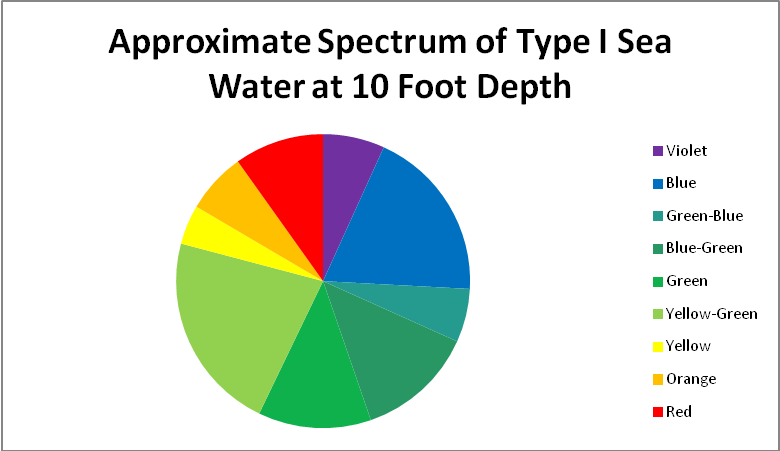 Spectral breakout of ‘green’ Type 9 Coastal water at a depth of 1 meter. Figure 9. Worst case light quality – Type 9 Coastal Water (in non-scientific parlance, really crappy water.) Yellow water color, phytoplankton, and turbidity have absorbed or scatter all wavelengths below ~525nm and above ~625nm. 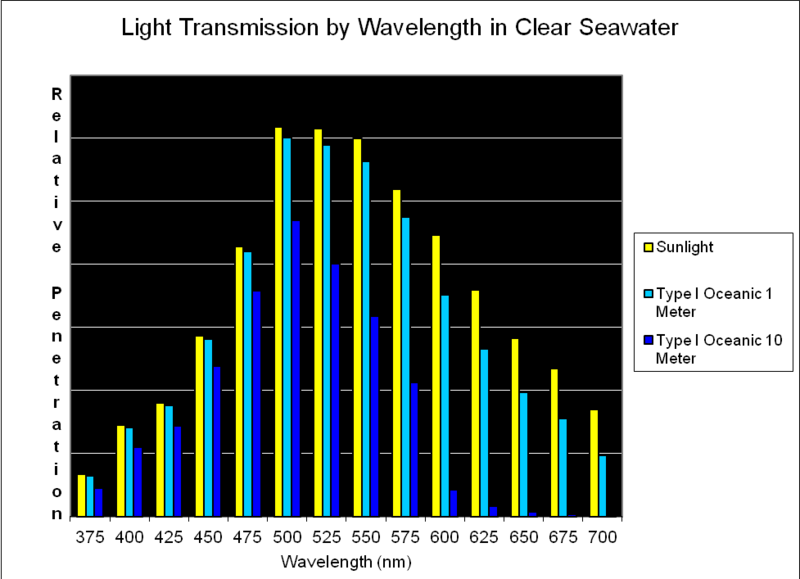 Calculations of light transmission through a particular classification can be made if we know how light is absorbed (or scattered) in a particular classification of seawater. For the purposes of this article, I have elected to use the attenuation coefficients of the most transparent of seawaters – Type I Oceanic. 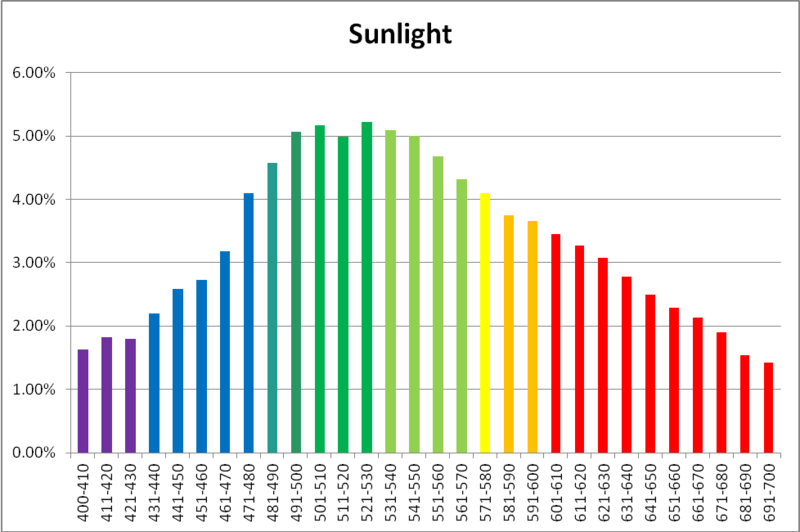 As Figure 10 shows, absorption of light is minimal at wavelengths of 400 -500 (violet – blue-green) and becomes significant at about 550nm. Orange and red wavelengths are strongly absorbed. This water is classified as Jerlov Type I Oceanic water and was collected at depth in the eastern Mediterranean, where suspended particles (of about 1 micron in diameter) are present in concentrations of ~0.01 mg/liter. In short, this water’s clarity is comparable to distilled water. Our discussion so far has examined factors that can affect both the quality and quantity of light through clear seawater. 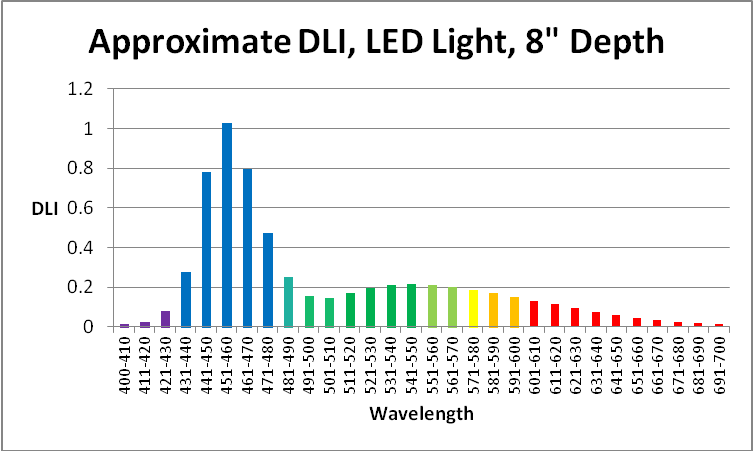 Quantifying the amount of light is relatively simple though not particularly easy. I am using data I collected some years ago using the following protocol. SCUBA dives were made at Honaunau (City of Refuge, Big Island of Hawaii) at noon in July. Light intensities were made with an Apogee quantum meter (housed in a custom-built waterproof housing.) A BNC connector on the sensor cable allowed it to be removed from the meter and ‘snaked’ through a small bulkhead fitting on the housing. In this manner, the meter remained protected within the housing while the sensor was outside and could be positioned to gather down welling or upwelling light. Water depth was estimated by an Oceanic dive computer. Results were recorded on a dive slate with a pencil. 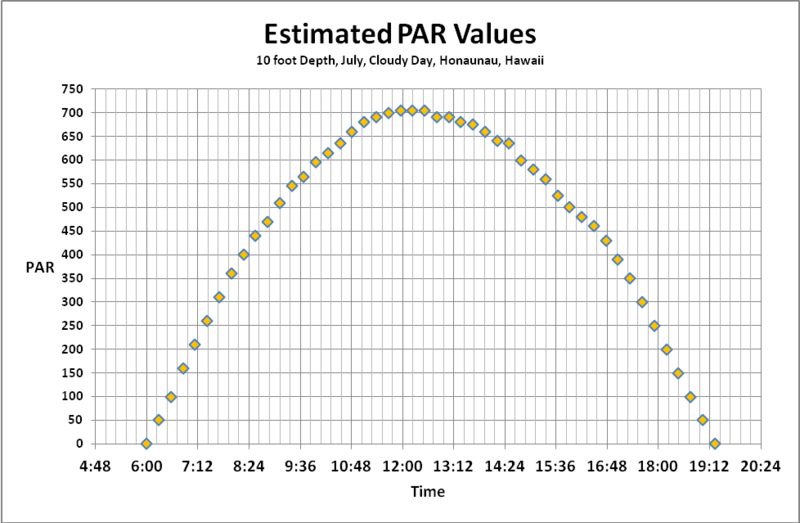 PAR values were recorded on sunny (low vog) and cloudy days. Figures 12 and 13 shows these results. 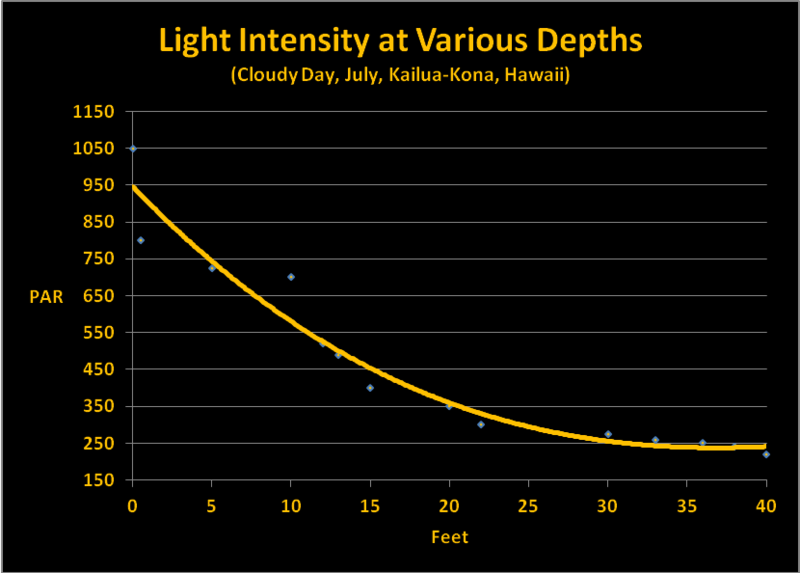 The Daily Light Integral is the total amount of light (or Photosynthetic Photon Flux Density, or PPFD) falling on a given area during the entire photoperiod. The best comparison is to compare PPFD to rainfall. An instantaneous PPFD value (the number of photons falling on a given surface area in a given amount of time) is equivalent to the number of raindrops falling on an equal area and time. We would find a weather report presenting rainfall as number of raindrops falling on a square meter per second to be practically useless. We are more interested in the total amount of rainfall reported in inches or centimeters. The same is true for light – we should be interested in the total number of photons in a given photoperiod. Someone once said, and I believe it was Charles Delbeek, that ‘an aquarium is not the ocean.’ An aquarium is subject to dynamics unimaginable in the ocean. Therefore I felt it prudent to look at water quality from both an aquarium and a real reef. Water samples from an aquarium and a Hawaiian reef were gathered in analyzed for pH, true and apparent color, turbidity, and suspended solids (volatile – or organic – and inorganic). Water samples were gathered from an aquarium and a Hawaiian reef. The aquarium had gone a few months without a water change and used a refugium filled with Chaetomorpha alga and a downdraft protein skimmer for filtration. Small amounts of an unidentified brown alga grew in the aquarium and provided a natural food for a single Yellow Tang (Zebrasoma flavescens). The sample from the reef was gathered at dusk of a day where the ocean was relatively calm. 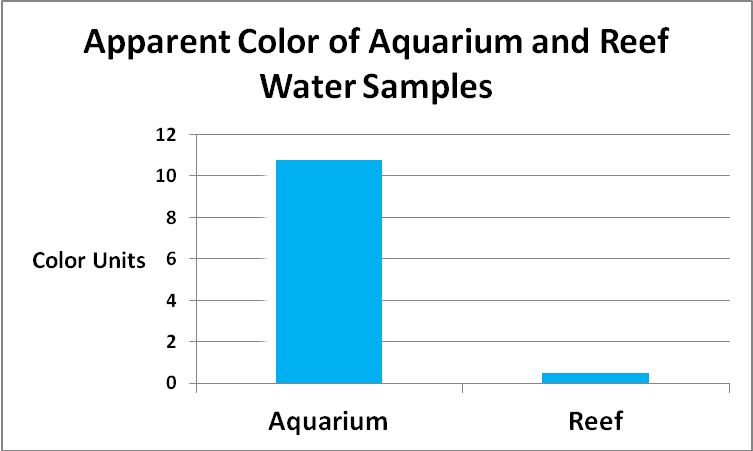 Hence, the aquarium sample could be considered as being towards ‘worst case’ and the reef sample ‘best case.’ These samples were taken to the lab and analyzed for ‘apparent color’ (samples were not filtered). 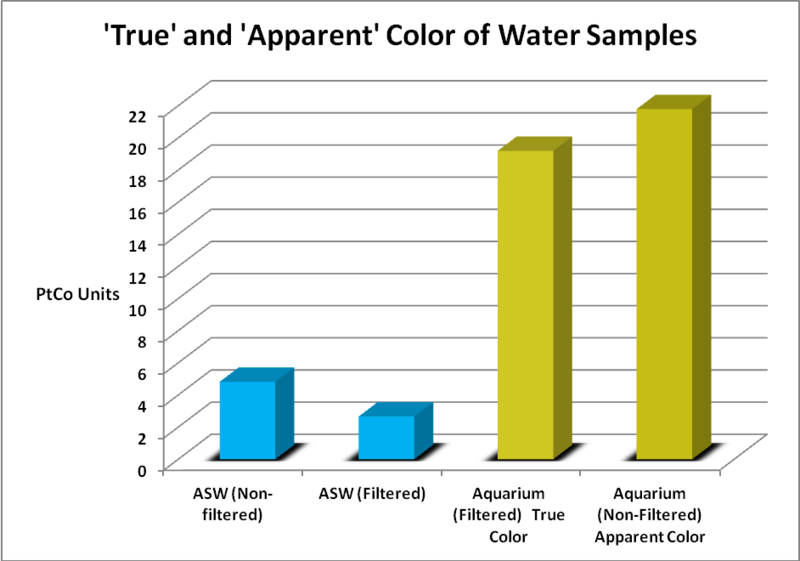 ‘True color’ (after the sample was filtered through a 0.45 micron filter) was determined on the aquarium sample only. Figure 19. 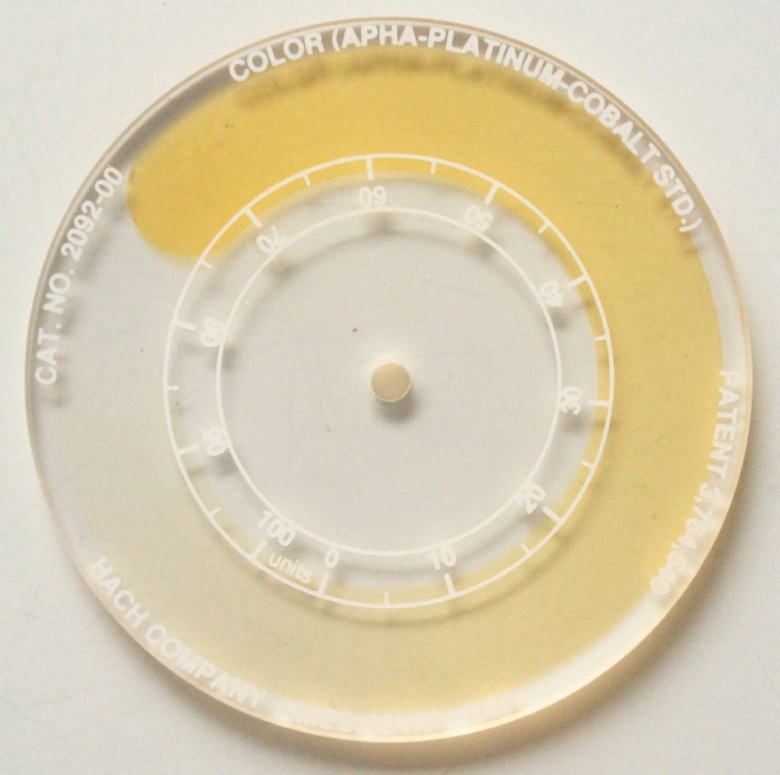 Aged water from a reef aquarium had much higher color (‘yellowness’) than water from a Hawaiian reef. Tripton is defined as ‘suspended non-living matter in a water column.’ This definition leaves a good deal of latitude in interpreting its true meaning. An examination of both water samples revealed unidentified detrital particles, none of which appear alive. For the purposes of this article, non-living material is defined as non-volatile suspended solids. This requires determination of total suspended solids and volatile total suspended solids. See Figures 23-25. Turbidity is defined as ‘the optical property that causes light to be scattered or absorbed by a particle rather than transmitted’. In other words, turbidity is a measurement of how much light is scattered by suspended particles. Many years ago, turbidity was determined visually using a cylinder of water and a candle. This method was reported in Jackson Turbidity Units, or JTU. 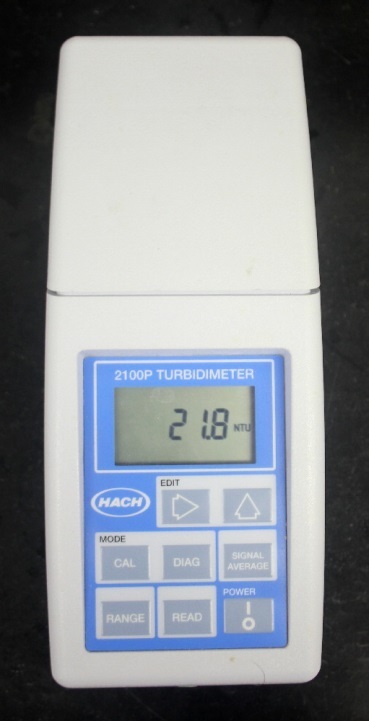 Advances in miniaturized electronics now allow turbidity to be determined with a photometer called a turbidimeter and reported in units of NTU (or nephelometric turbidity units). See Figure 26. Figure 28. The standard I’ll use for comparing sunlight at depth to aquarium lamps’ spectra. The LED luminaire is from Build My LED (www.buildmyled.com), a Texas-based company that builds LED fixtures to the specifications of the customer. The LED used for the experiments in this article is a 48″ strip housing sixty LEDs generating light peaking at 450nm and 470nm as well as broad spectrum white light rated at 4500 Kelvin. The sequence of LEDs in this luminaire is 450nm – 470nm – 4500K – 4500K. This sequence repeats 15 times for a total of 60 LEDs in a 48 inch strip. 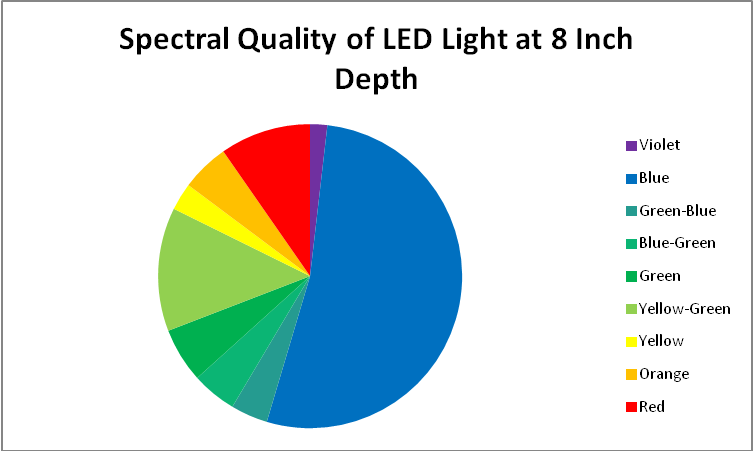 Figures 31 – 33 & Table 3 show a breakout of the LEDs’ spectral qualities at a depth of 8″ (about half the depth of the average aquarium). Based on the information present above, and using a photoperiod of 12 hours, we can calculate the Daily Light Integral (DLI – the total dose of light in a given photoperiod). Figure 33. 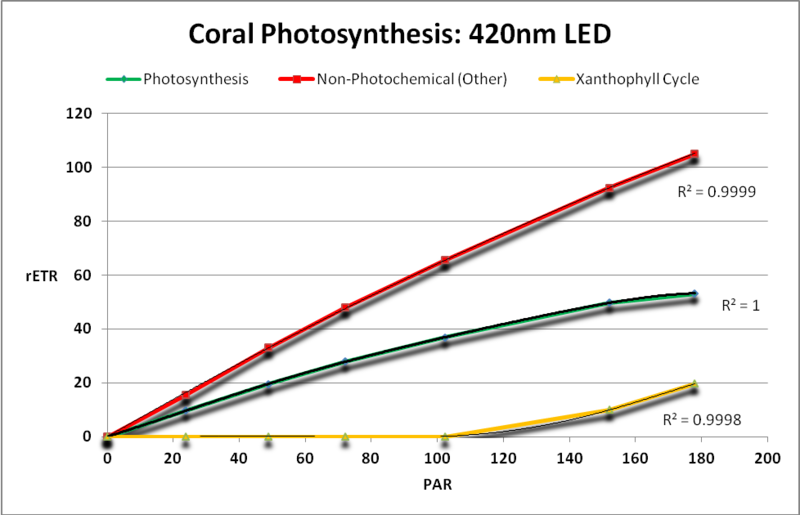 Aquarium light DLI (mol photons per photoperiod) generated by LEDs at 8″ depth in an aquarium. PAR is 150µmol·m²·sec and the photoperiod is 12 hours. Figure 35. 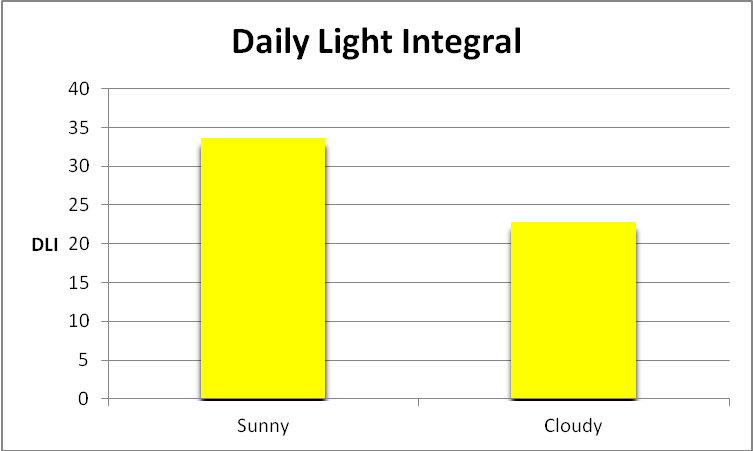 Daily Light Integrals – reef and aquarium. 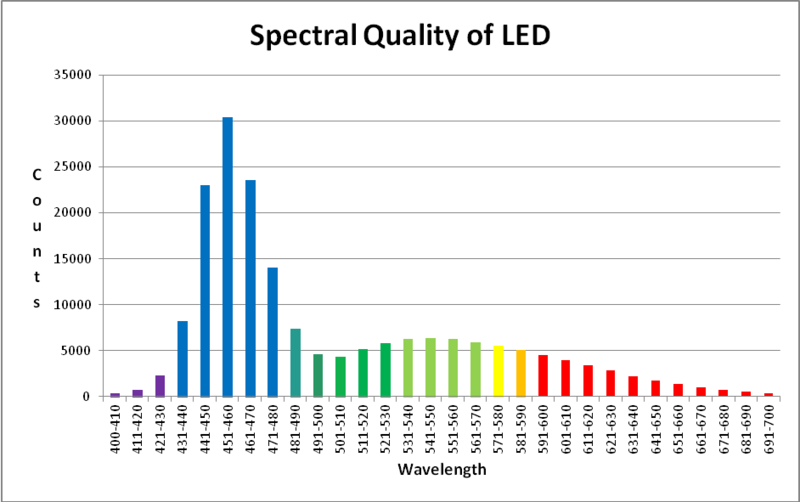 It is important to remember that the light intensity of the LED strip is relatively low. 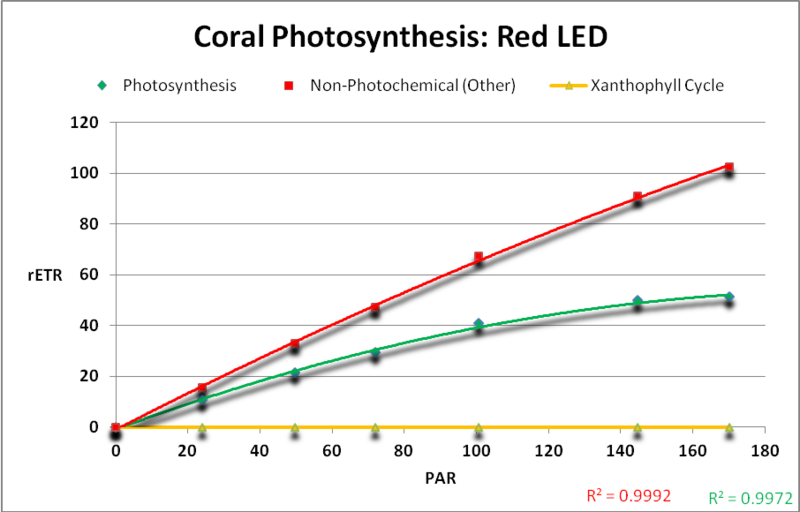 If the PAR value were to increase to 300 µmol·m²·sec, many corals’ zooxanthellae would be at their photosynthetic saturation point, and increasing the amount of light might be detrimental. 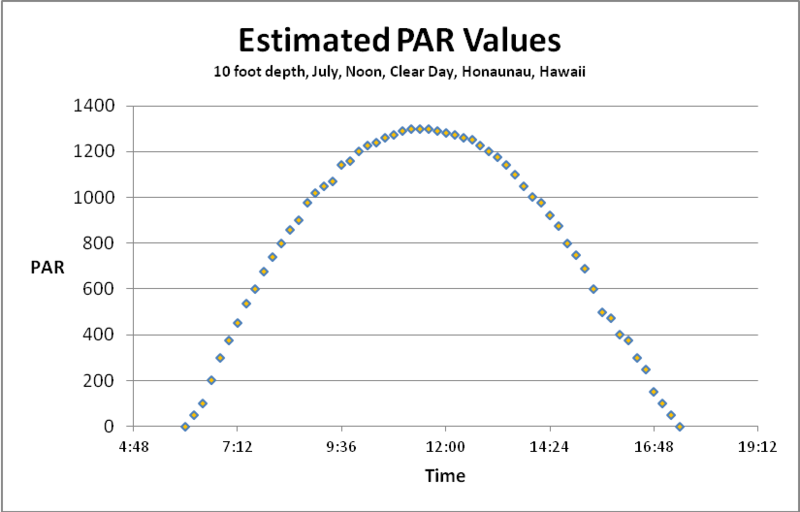 Note that blue wavelengths (431 – 471nm) at a PAR value of 300 would exceed those seen by a coral at 10 feet in clear water during the summer. 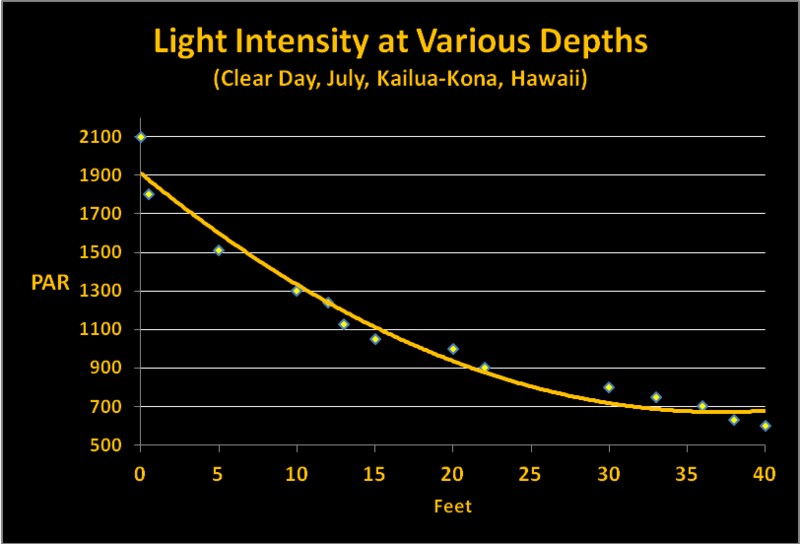 Many factors must be considered when estimating light intensity and quality at depth. The quality of sunlight must be considered, as well as sky conditions, as well as amount of aerosols and particulates (as estimated by visibility or air transparency). 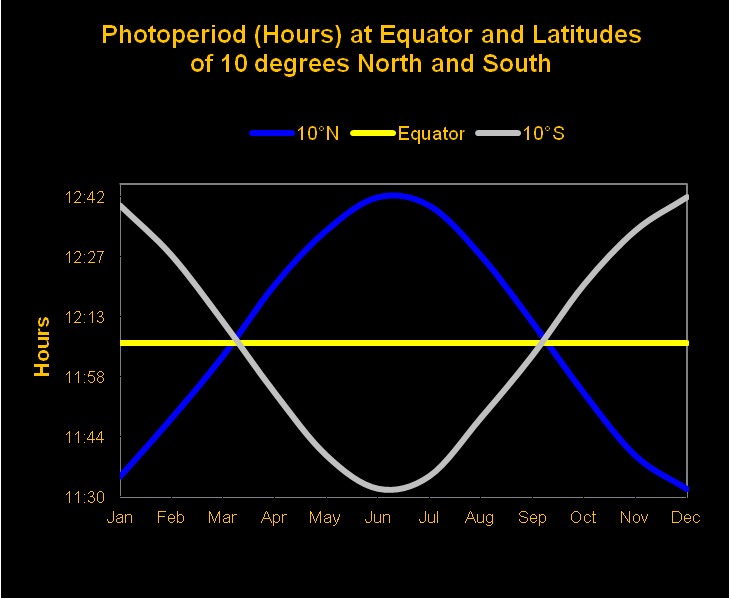 The quantity of light depends upon these conditions in addition to seasonal changes. Turbidity and true color of water are factors that affect light transmission once light enters a water column. In short, estimating the quantity of light is fairly easy, but calculating light quality at depth, without sophisticated instrumentation and personnel with time and training to monitor these computer-driven devices, becomes an educated guestimate. And this is certainly the story here. 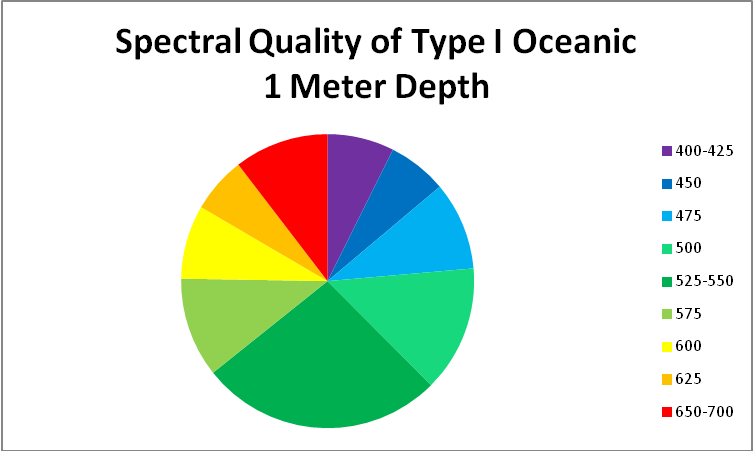 Our estimates are based on data gathered from various reference sources meshed with field information garnered by a spectrometer and quantum meter in an underwater housing here in Hawaii. At best, it is fuzzy science – but is suitable for our purposes. We should not be overly concerned that this information is not universal and absolute. The challenges of comparing aged aquarium water to that sampled from a Hawaiian reef required further data collection involving analyses of total and volatile suspended solids, color of water, and turbidity. Based on the information presented in this article, aquarium water can be less turbid but contain dissolved and suspended particles that lend to a higher value of apparent and true water color than that of water from the real reef. Under different circumstances, where an aquarium’s water quality is maintained with activated carbon, judicious use of ozone, and regular water changes, the situation with color could be reversed. The same might apply to turbidity caused by suspended particulate matter. In the case presented here, aquarium water had fewer suspended solids. 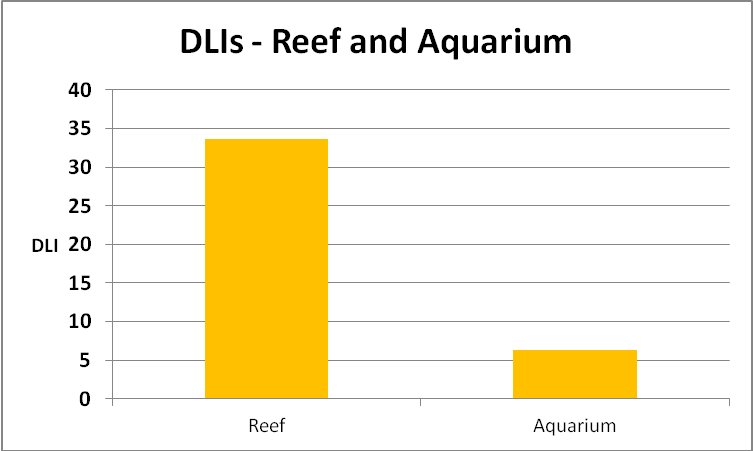 Realizing that conditions in an aquarium and a natural reef can be highly variable should not prevent us from learning from the lessons these data present. There are intriguing reports of hobbyists and commercial coral farms growing brilliantly colored corals under extremely low light levels. At present, the hypothesis is that the relatively high amount of blue light at relatively low light intensity (PAR) is the environmental trigger for not only rapid growth but extreme coloration as well. This flies in the face of opinions of many hobbyists, where the thought is that corals, or more correctly, their zooxanthellae, are infinitely adaptable to higher amounts of PAR (the ‘more is better’ train of thought). 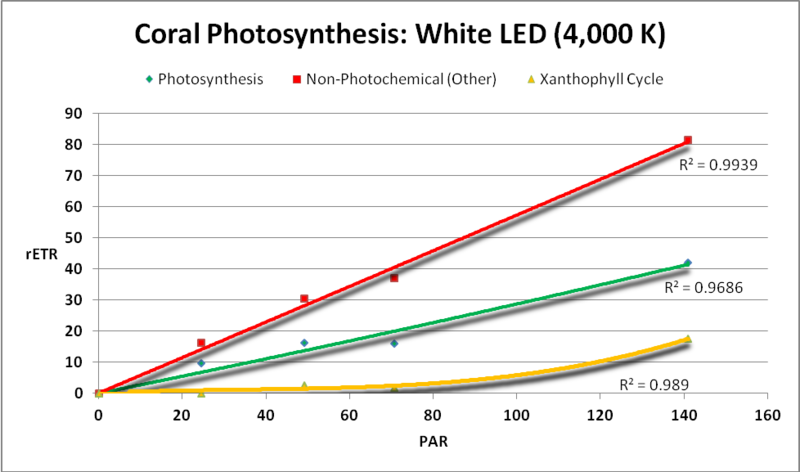 Experiments are planned to examine photosynthetic efficiencies of LEDs producing differently colored light. 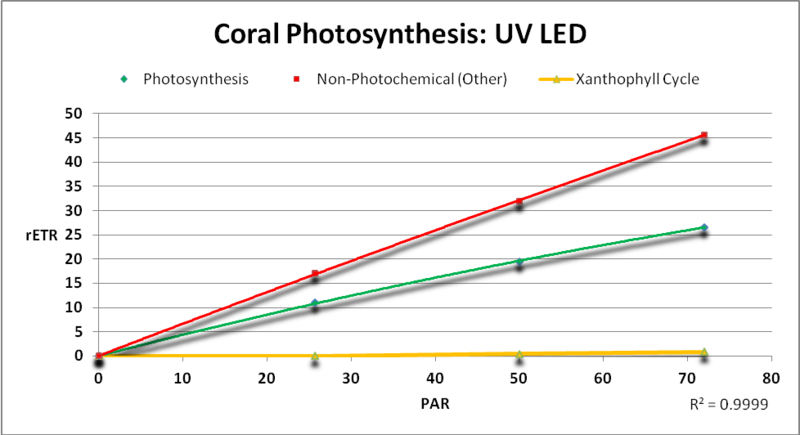 In addition, I have new information about blue light and its fate when promoting photosynthesis (or not) in corals’ zooxanthellae. But that is a discussion for another time.